I used to love mashing buttons and beating up greasy thugs back in the day, but as I age, the appeal of the beat-em-up lessens more and more. The classics – Streets of Rage 2, Double Dragon II, River City Ransom – will always be classics, but the majority of the genre is either unplayable or overly repetitive, even with friends. Golden Axe is often championed by the Sega faithful as an untouchable (Sega must agree, as they’ve re-released it about a dozen times for various platforms over the years), and while it is a completely competent beat-em-up, its cliché fantasy trappings are in want of a soul. You guide one of three warriors through eight stages to destroy the evil Death Adder and retrieve the legendary Golden Axe. Warrior # 1 is Ax- Battler (his legal Christian name, no doubt), a barbarian with a mighty wallop and unbearably slow movements that leave him open for beatdowns. Warrior #2 is Tyris Flare, an Amazon babe who fights in revealing clothing for the good of her tribe. She’s fast and has a strong Fire magic attack, but her slice is weak. Warrior #3 is Gilius Thunderhead, a dwarf who’s both limber and strong. What he lacks in Lightning Magic, he makes up for with his mighty ax. For an all-around powerhouse who’ll get you to the Death Adder battle with little trouble, Gilius is your man. I mean, look at him. He’s the man. Each warrior has a surprisingly wide range of moves: jump, attack, jump-attack, run and headbutt, roll around on the ground, and magic. Your attacks are standard beat-em-up procedure: punch, knock on the head, throw backwards, stab, etc. The jump-attack is a swift hit that causes little damage, but allows you to run away before the enemy gets up. Rolling around is an evasive maneuver that’s tricky to pull off, but much needed for later boss battles. 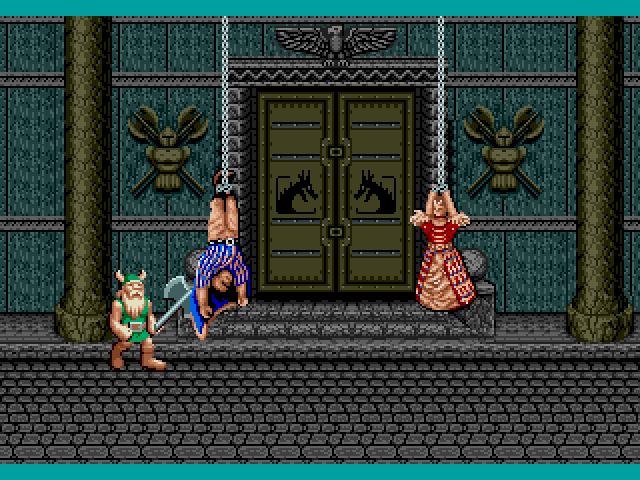 Magic is acquired by kicking the smiling blue elves and collecting their precious blue pots (in a strange bit of generosity, Golden Axe conveniently halts battle when they appear so you can kick them). You can unleash a small magic attack with as little as one blue pot in your reservoir, but the more pots, the stronger your attack. Getting an enemy into a pattern is easy, but even the weaker enemies take a bunch of hits to kill and if you stray too far from them, they’ll run towards you. Enemies usually bring a partner, and they’re more than willing to double-team you, so watch your back. 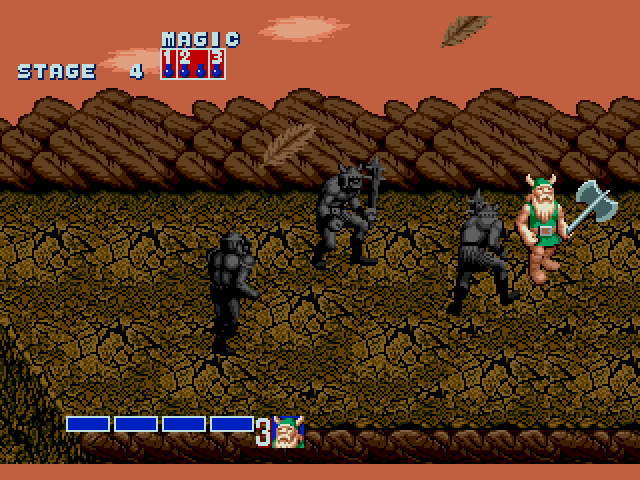 Surviving in Golden Axe is as much about maneuvering around enemies and lining them up, as it is attacking them. Don’t fall off the bridge, Gilius. You have a reputation to maintain. The majority of games in the beat-em-up genre take place in urban cities, so kudos to Golden Axe for straying into the fantastical. Still, compared to Revenge of Shinobi‘s cyberpunk/neo-Japan and Mystic Defender‘s nightmarish environs, Golden Axe‘s imagery is downright conservative and boring. The creature designs are rote – knights, skeletons, mace slingers, all repeated ad nauseam – as are the level layouts, most of which are walkways with no interesting foreground or background elements. Even the levels that supposedly take place on a turtle and an eagle, are little more than straightforward paths with eagle and turtle heads attached. Along with the aforementioned kickable elves, the rideable dinosaur/bird creatures named Bizarrians are the most memorable element in the game. While it’s easy to get knocked off of them, their strong tail/fire attacks will lay waste to all who oppose you. Lambda Phi always throws the weirdest parties. 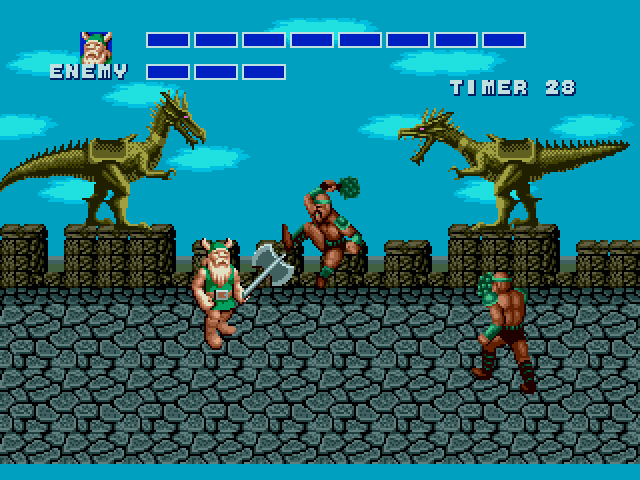 Naturally, the Genesis port of Golden Axe suffered some changes from the arcade version. The ridiculous and amazing ending where the main characters escape from the arcade and wreak havoc in the real world, has been replaced with a ‘Thanks for beating Death Adder!’ note and a cast lineup. The majority of the levels are shortened, but Sega added another level and a final final boss battle with Death Adder’s father, Death Bringer that’s just bonkers hard. There’s also a new mode called “The Duel,” where either two players face off against each other or one player takes on twelve rounds of increasingly challenging enemies. It’s a nice gesture to extend the game’s replay value, but unless you want to see a shortened version of the end credits, don’t even bother. 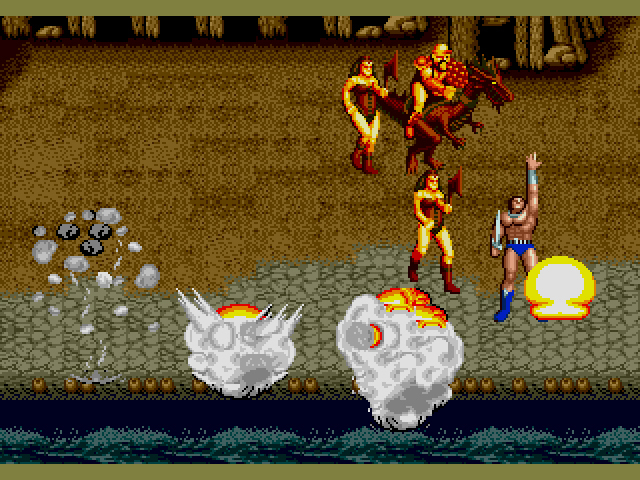 When Golden Axe released on the Genesis at the tail end of ’89, it was as faithful of an arcade conversion as you were likely to see and solidified Sega’s argument that the Genesis produced “arcade perfect” ports. This made it a crucial game in that bygone era, and Sega’s constant repackaging of the game implies as much. Today, however, in an age where arcades barely exist and beat-em-ups as a genre are all but dead, Golden Axe is a reminder that nostalgia doesn’t always work the way we’d like it to. Hans Christian Andersen, please, put some pants on. I’m sure it doesn’t help that I’m less than enthused by both Golden Axe and beat-em-ups, in general, but I’m sorry, friends. Golden Axe for the Master System might be a technical achievement, but it is right and proper crap. The drab, colorless graphics are worse than most NES games, and the choppiness and slowdown hurt my focus; Sega incorrectly reasoned that the game would be stable with more than two enemies at a time. God help you if you’re trying to throw an enemy. I thought the game froze during a couple battles, before I realized that my character was just trying to pick up a skeleton. This isn’t a screenshot of a bootleg Famicom version, I promise. And for those who think I’m being unfair, listen, I don’t care that MS Golden Axe only has five levels compared to the Genesis version’s eight. As far as I’m concerned, Sega did me a favor with that choice. And I don’t care that you only get to play as Ax Battler, my least favorite character. Sega increased his speed and made him control like less of a girthy barbarian. Finally, I don’t care that the Master System port doesn’t look and play just like the Genesis version. That would be silly, what with the 8-bit difference and all. But when a game revels in poop colors, runs at a few frames per second, and literally makes me feel queasy when I play it, I draw the line. Golden Axe for the Master System is an abomination unto my senses, and I’m completely fine with being the only one who thinks so. Looking forward to the second one, for sure. So this game really is like a double dragon clone. Well at least inspired by. Maybe the best one in the arcade. And it added to the genre. You now had magic,creatures to ride on, and characters who had different attributes. All great additions to the genre. But it very much plays like double dragon with a character who attacks with varying moves against waves of enemies and bosses. And it looked and sounded great in the arcade. A real favorite of mine. But this version while playing like the arcade, was not quite as good as the arcade. For one,not wasn’t carbon copy. It couldn’t match the arcade visuals, the levels were different, sure it added bonus levels but it was in a bland drab castle. And against a pallet swap of Death Adder. Wasn’t much of a bonus. If you asked me what I don’t like it was hard to pin down because it played great. I think the arcade was just better. At the time this came out, it was pretty much the pinnacle of beat em ups. Yet I still never bought it and only rented it. Loved the soundtrack on this too. I believe the smash pack version on Sega CD adds the arcade music and sound samples. I never cared much for the Golden Axe 2 and 3 didn’t look that interesting to me. Because really you had Streets of Rage already. My true favorite in the series is Golden Axe 2: The revenge of Death Adder I. The arcade. It is hands down the best Golden Axe game, and never received a home port. I’d love to have one. To me the game I much preffered to this that plays similar is Alien Storm on the Genesis. It is more or less Sci Fi Golden Axe with aliens, and the weirdness of that game makes it much more interesting. I would recommend someone play that game over this one if they wanted to try a Genesis beat em up not named Streets of Rage. Yes, Alien Storm! I love that one. Very different tone and feel compared to most beat-em-ups. Never played Golden Axe in the arcades. By the time I went arcade slumming in the early 90s, 4 player X-Men, TMNT, and Simpsons were the pinnacle of beat-em-ups. I absolutely adore this game although my main memories are with the Atari ST and Amiga versions the Mega Drive is probably the best home port. This was our go to beat ’em up for multi player hijinks when we were teenagers. Loved the setting as well it felt like we were in our own Conan movie and the riding of beasts added a fresh mechanic to the beat ’em up formula. Also arguing over who got to ride the beasts, have the magic pots and food was the cause of many teenage rage strops. And the music, oh the music I loved the epic, fantastical tunes this game belts out. They are still ingrained in my head to this day. Scrolling beat ’em up is the genre my brother and I used to always play together so I’m a big fan of the genre. For me Golden Axe is just behind Streets of Rage and Final Fight CD in the awesomeness stakes. So on this game sir I respectfully disagree with your score a B+ at least for for me and an A on multiplayer. I do however sort of agree with your Master System score, it looks decent in stills with the large ‘sprites’ but it moves like crap. Back in the day I had the ST version, my friend across the road had the Amiga version and my other friend from the same street got this for his Master System. As you can imagine he soon traded in for a 16-bit version ! I also believe this game used animated background tiles for characters (like Space Harrier did) instead of sprites. The benefit is it eradicates flicker. The downside it’s choppy as hell. Still I’d have given it a D- for the attempt. Yeah, Golden Axe definitely felt fresh back in the day. I loved it growing up. Beat-em-ups were one of my favorite genres and my cousin and I used to go HAM on a number of different brawlers for both Genny and SNES. 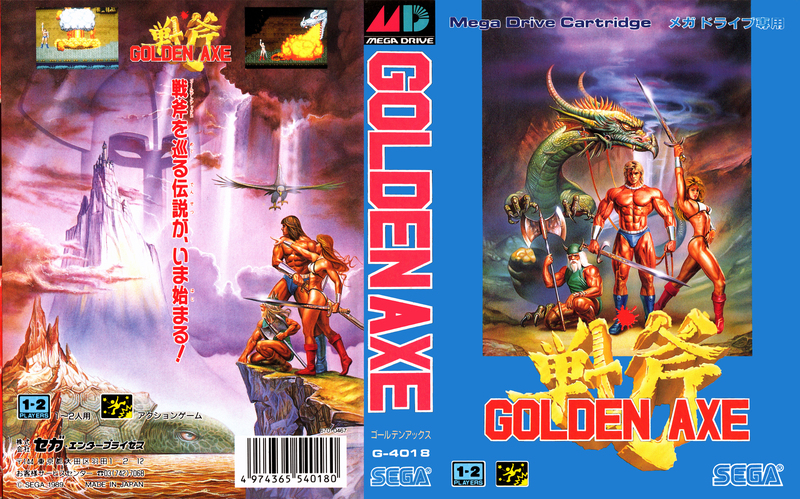 Golden Axe, though… I don’t know. It just hasn’t held up like some others. Wow, you didn’t really enjoy Golden Axe, did you? I can’t blame you – it’s very much a ‘SEGA’ game. A good looking but shallow arcade port. Being a Brit, I grew up with SEGA so Golden Axe is a game I love despite all it’s faults. Had I grown up with Nintendo instead, I would probably be obsessed with the likes of Castlevania instead. Golden Axe wouldn’t get a second look. I recently replayed all three Golden Axe games on Steam recently and I reckon the first is the best by a mile – if you found the setting dull in GA1, wait until you get to GA2 and GA3…those two games feel very uninspired. On the other hand, GA1 is a fun beat em up that doesn’t outstay it’s welcome. Think of it as an upgrade to Altered Beast, an arcade game that is great for a quick 30-40 gaming session. And you’re spot on with the Master System review….even as a kid, I was disappointed with that version. The Master System really doesn’t have any good beat em ups. Interesting take re: the rest of the GA series. I’d heard GAII was the pinnacle, while III is pretty much universally reviled. I actually played and enjoyed Golden Axe I and II back in the day, but they were one-time rentals at best, even then. 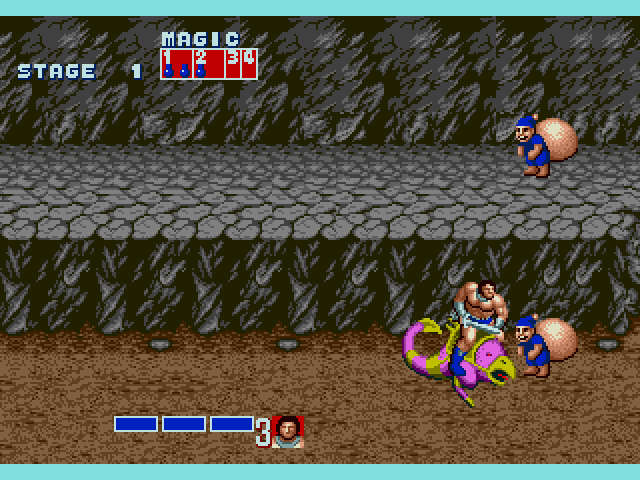 Even back in the day, Golden Axe was… just kinda there. Never actually all that fun to play to be honest, very repetitive, but I guess better than most of the alternatives. Speed-runs make a lot of games look more appealing than they actually are, I’ve noticed. I enjoyed both of these games. For an early release Genesis and late Master System game the graphics were fantastic. The Genesis version was much improved from the arcade version with added content. As far as the colors, the drab colors were intentional for the medieval mood they were trying to set. I like the controls and hit detection for both games as well. I’d give them both A’s, at worst a B.
I imagine if I had come into Genesis Golden Axe on a whim, I might be more impressed with the visuals. Revenge of Shinobi and Mystic Defender really set the bar high, though. It’s pretty rare – I was only able to play it on a poor quality ROM, but it was worth it. Surprised SEGA had never reissued it. If you ever do get to the SEGA arcade reviews Dylan, it’s one worth seeking out. If I could have one arcade game, that would be it, one of my favorite arcade games of all time. And only playable in the arcade. Plus it had 3 players. And it switched up everything. Like the magic was drastically different. One guys magic was to grow an apple tree that dropped health pickups, instead of offensive magic. The original Gilius Thunderhead plays as an old dwarf riding on a Giants back.mthere is a centaur. You can ride animals, and then pick up catapults to put on your animals. It’s like a fantasy mech. It has 3D into the screen sections. It’s has branching paths where you choose which stages you play. It’s just amazing. I think what happened is Golden Axe was king at the arcade for a while, but the game that knocked it off of the beat em up block was Final Fight. It improved on the formula so much and I think it may have been out by the time this was released on the Genesis. (In the arcade anyway.) It made this game less appealing once you played Final Fight. Final Fight’s great fun on a few quarters, but as a home game? Man, the repetition is murder. There’s none of Golden Axe’s high risk aerial dogfights, reverse strikes, or saving the magic for just the right moment to unleash hell. It’s just mash the buttons to win, and try not to accidentally pull off your super move. It’s no wonder why Streets of Rage made everyone forget it’s sequels ever existed. Thanks for the link Sean – never realised it was three player! You’re right, it had some great features that would have been welcome in a Mega Drive GA sequel. Revenge of Death Adder came out in 1992, while Golden Axe 2 came out Dec 1991 (1992 in Europe) so both games were likely in development at the same time….SEGA may have been better off just focusing on one of them. Either way, it’s strange how SEGA have never re-released it or ported it to another system. The game game out on Sega’s system 32 board. The last series of arcade boards before Sega jumped to the Model 1. Almost all system 32 games have never seen a home port. Like Spider-Man. Conceivably this maybe could have been done on Saturn but it would really tax the system. Also the comet rated more on porting the Model 1 arcade games to Saturn. System 32 was like the ultimate super scaler board and most of the games used crazy 2D super scaling 3D effects. The only system 32 games to be ported were Rad Mobile as Gale Racer on the Saturn, which wasn’t nearly as good as the arcade technically. And Outrunners the sequel to Outrun received a Mega Drive port which is nowhere close to the arcade. I think that board just slipped into a spot where it wasn’t feasible or desired to port the games to console. The mega drive wasn’t near powerful enough, and the Saturn focused on true 3D game ports (if it could even do these super scaler games justice,) Thus pretty much none of those games are anywhere else but the arcade. 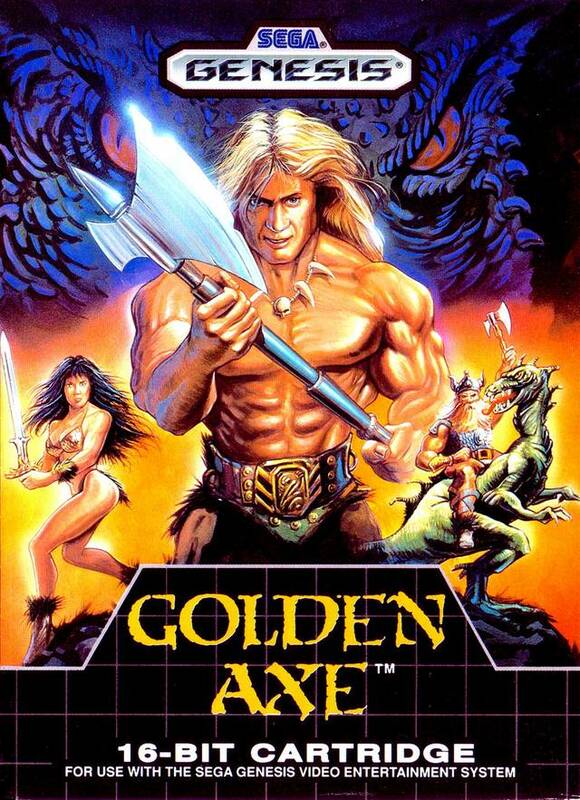 The most missed by me obviously though is Golden Axe. I wonder if M2 could do something with these on the 3DS? Great post Sean, agree this is a sorely missed range of games we never got to play. I’m sure the Saturn could have pulled these off, probably at 30fps rather than 60fps. However there must be demand for Sega to release Revenge of Death Adder and OutRunners on the lower risk digital platforms. I’m always staggered considering Sega’s strong arcade heritage why they don’t pump out Arcade compilations. The only ones I’ve seen are the Sega Memorial ones on the Saturn but they are of ancient arcade games from around the SG-1000 era rather than their late 80’s early 90’s offerings..
My fond memories of the Master System port are summed up as an F?? Ha, when you didn’t have anything but a Master System back in the day, anything that resembled Golden Axe was good enough. An F is for the Alf’s and My Hero’s. Golden Axe certainly deserves better than that, even in its inferior form – No offense though, I’m sure my memory of one of my favorite Master games has not aged well. Interestingly, this version uses no sprites and instead uses background tiles as the characters. This was done presumably to allow more enemies on screen and larger sizes than sprites would allow. The drawback is choppiness, as the cpu had to draw each frame from a new background. The upside is no flicker (I’m looking at you Double a Dragon). Never played the Genesis version, although I’ve played the arcade version in my MAME cabinet to death, and dumped some quarters into it at the arcades. I wholeheartedly invite you to emulate the game and experience it anew. I did one even better – I fired up my copy on unemulated original hardware. Haven’t played in over 20+ years. But is it Golden Axe at it’s core? Check! Maybe you had to have grown up with it to look past all the crap, but I still had fun playing it. I actually am amazed how the programmers were able to overcome the system’s sprite limitations and display nice sized characters. Imagine if they would of resorted to using sprites like in double dragon – definitely wouldn’t resemble anything like Golden Axe. This game succeeded for me in an era when it brought the taste of the arcade experience to my living room without having the Genesis. It hasn’t aged good, but it’s a commendable effort Sega made to make it feel like Golden Axe. The designers could of made it more playable by replacing with sprites, but you’d have a game that wouldn’t resemble anything like the arcade. There’s another reason for the background tiles as characters – The Master System can’t flip sprites. It would need to draw every single character animation twice, and still fit it into the tiny cart space. Imagine Golden Axe with half the characters or tiny sprites that are barely recognizable on a vast, empty screen. Great insight Sean – it sounds like there is a lost generation of arcade games from that time period. I played a lot of Golden Axe on the Genesis when I was a kid, because there was that “Sega kid” in my school who had the Genesis first, and Golden Axe was one of the games we’d play. Later, when I got my own Genesis, I borrowed it from him numerous times, and enjoyed the heck out of it. Having played it again recently for a Golden Axe-a-thon for a community gaming event, I can see the flaws pretty glaringly, though it remains a fun, if overly simple, experience. GA2 is an improvement in nearly all respects: the graphics are brighter and more colorful, the music is louder and generally more memorable, and the game’s challenge curve is perhaps a bit tighter. I’m not sure why GA3 is so reviled, because from a design standpoint, it’s probably the best home console game of the series. It has the most interesting setup, branching paths that add replayability, some minor RPG elements (leveling magic), and the widest variety of enemies and obstacles. If you cover GA3, I think you’ll find that, objectively speaking, it’s probably the best and most fully realized game in the series. You definitely provide the best arguments for GA3 that I’ve seen. I’ll keep your comment in mind when I play it. Thanks Josh! 3 is definitely not like the other games. I got it for the Wii and it is not horrible. 2 is so much like the first one that I’m not sure it even deserves to exist. Warning: There are always sacrifices when dealing with limited cart space. GA3 has the most replay value, but guess what had to be cut in order to make that happen? 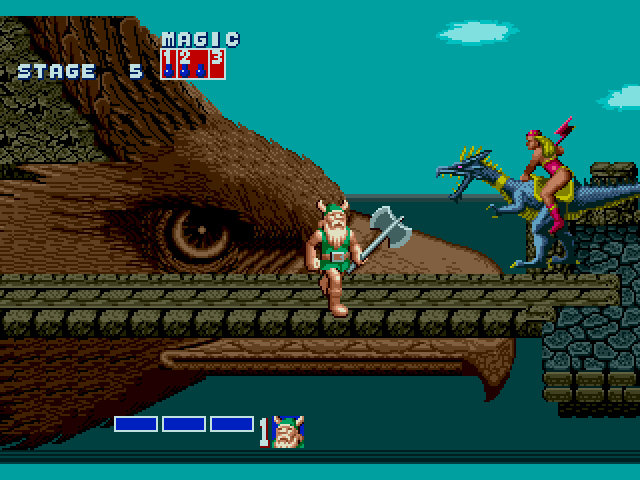 Imagine Golden Axe without the animal heads or the cool magic. The fog magic is it’s own circle of disappointment Hell. It’s the only game in the series that I’ve never beaten, and it has nothing to do with the difficulty. With that said, I think you were too hard on the first game. There’s at least some basic strategy – if you just mash buttons like this is Final Fight, the enemies will cut you apart. I agree about the bland console ports. My best friend had the SMS version back in the day and we quite enjoyed it for what it was. I bought the Mega Drive version at my earliest opportunity, but it always felt off to me. The graphics were too muddy, the sound ropy, there were a lot of presentation cuts (petrifying corpses, varied death screams, Death Adder reconstituting from the maggots) and the last stage was pointless. I loved the arcade game but this underwhelming. I think you might be in for some disappointment with the MD sequels. GA2 arguably plays better, but it’s lumbered with what might be the most annoying death scream ever. I’m firmly in the “GA3 is woeful” camp. I agree with Sean that the arcade sequel is the best in the series and probably my favourite arcade game. I’ve had some MAME success with it – worth the effort. I will forever defend the Master System as it is one of my favorite consoles and I will not apologise for that. 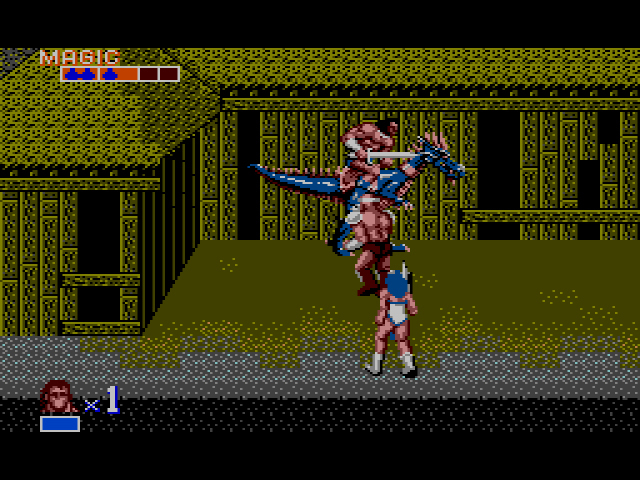 However, the SMS Golden Axe is awful. They tried too hard in my opinion. They should have a game optimised for the 8 bit system like they did with Streets of Rage. I’m not saying it would be good but it wouldn’t be as bloody frustrating as that game is. I hate the fact that if you get hit once you are essentially stuck there waiting to be hit again and again until you fall over. Ouch, an F. But yes, it’s a very bland game if I remove my nostalgia goggles. I do love the title screen track though!